What is a birthstone and what birthstones should I be wearing? Maybe these are questions you have asked yourself. You can find the answers to all questions you’ve ever had about birthstones below. Traditional birthstones are the birthstones that were used before 1912, when the modern system of birthstones was introduced. 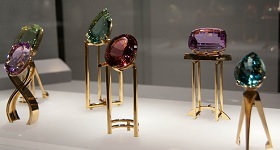 These birthstones are a great alternative if you dislike your modern birthstone or when they are simply too expensive. The list of birthstone colors by month seen below will make it easier to find a replacement for any birthstone. Perhaps a certain birthstone is too expensive, like diamonds and rubies. Or maybe the birthstone simply isn’t your style. Plenty of alternatives are available though. For example diamonds can be replaced with white topaz. Rubies can be replaced with far cheaper spinels or garnets and they look just as amazing! This allows you to switch your birthstone, while still keeping the color that people associate with those months. The history of birthstones starts at the breastplate of Aaron containing 12 different gemstones. These gemstones represented the 12 tribes of Israel. Today they are believed to have formed the basis of the traditional birthstones. Which in turn have had a large influence on the modern system of birthstones. Though other cultures lay claim to a system of birthstones as well, leading to a varied list of traditional birthstones that one can pick from if they don’t like their modern variants. It’s likely that they were worn by everyone originally, because it was believed that the powers that gemstones had were higher during their ‘birthstone month’. Over time this changed to birthstones having more power to people that were born in the same month. The list of modern birthstones was introduced by the Jewelers of America in 1912, trying to standardize the growing amount of birthstones. This is currently the most widespread system for birthstones in the US and a large number of other countries. Should I Only Wear My Birthstone? People often wonder if they should only wear the gemstones that are their birthstones. The short answer is: No, feel free to wear a gemstone that is not your birthstone. It is just the traditional gemstone associated with your month. Some people will only wear their birthstones. Others that do not like their own birthstones, because of their look or price, will wear another gemstone with the same color. Most people however will just wear the gemstone they enjoy most. Not paying attention at all to birthstone colors, birthstone signs, etc. You will have to find out for yourself what you prefer, tradition or modernity, there is nothing wrong with either of them. Can I wear other stones except my birtjstone?